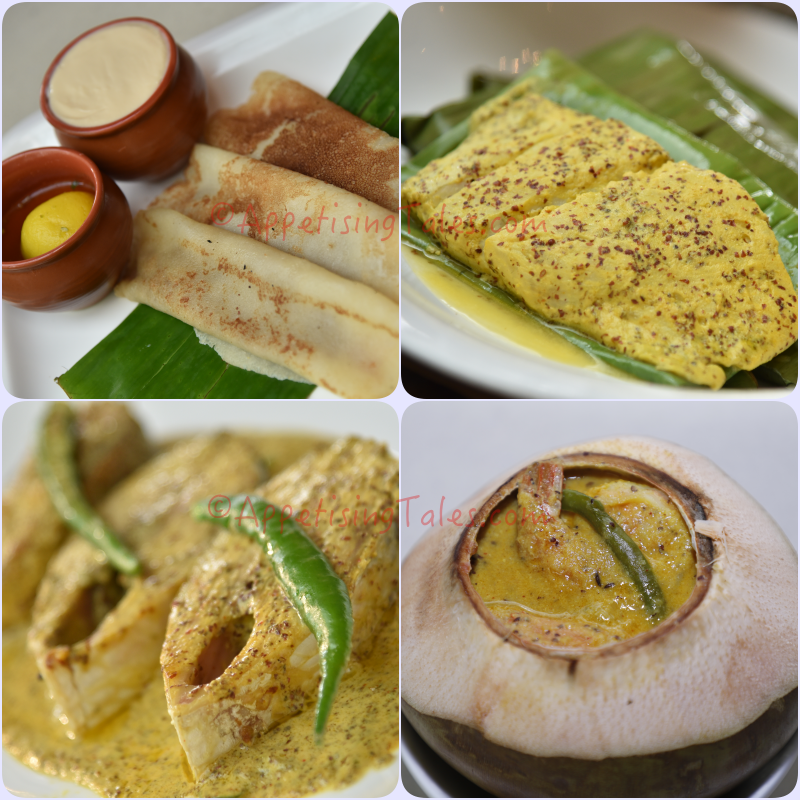 Sharing a table with Chef Subrata Debnath is like opening an encyclopedia on Bengali food. So passionate is he about this cuisine that it was only natural for him to curate a festival on the aromas of Bengal. With assistance from visiting Chef Rajib from Taj Bengal, Kolkata, Chef Subrata is proud to showcase authentic Bengali fare as cooked in traditional homes. The a la carte dishes can be served Thali-style. Desserts Gurer Paayesh, Pathishapta, Mishti Doi. Amidst conversations about the traditional style of making kasundi mustard and elaborating about ‘radhuni’, an indigenous spice that looks like ajwain but has a mellow sweetness to it, Chef shares a platter of appetisers. While the melt-in-the-mouth mutton cutlet, or mutton chop as it is popularly known as in Kolkata, is perfectly spiced and marinaded, the rui maachher patishapta is Chef’s twist to the traditional patishapta that is usually served as dessert. Essentially a crepe, here it is stuffed with minced rohu fish, green chilli and homemade ghee. Both the appetisers pair beautifully with freshly prepared kasundi mustard as Chef Subrata is vehemently against the bottled kasundi that one finds in grocery stores. The rest of the meal is as flavourful owing to the preparations that are made from scratch with carefully selected ingredients. Chef Subrata Debnath (L) and Chef Rajib. 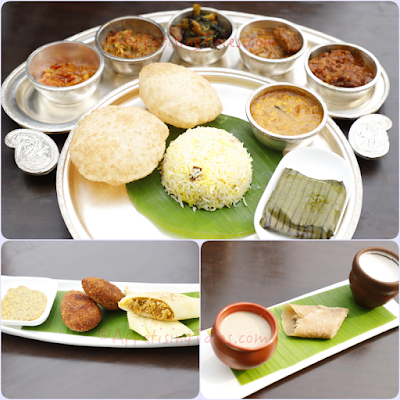 Although the festival features an a la carte menu there is an option of having a selection in a thali-style as well. Our beautiful thali comes with a delicious chholar dal sprinkled with chef's special masala which is incredibly delicious and pairs so well with the loochi. Then there's kadoli pushpo ghonto (young banana blossoms cooked with diced potato and coconut), palongshaager chorchori (spinach with pumpkin), Dhakai mangsho kosha (meat cooked with a grandmother’s recipe from Bangladesh) and kacha lanka bata murgi (chicken cooked with green chilli and onion). Bhetki paturi is deliciously steamed beckti that is marinated with stone ground mustard. It is neatly wrapped and steamed in a banana leaf that is roasted before the fish is wrapped into it. It is these kind of details of ingredients and techniques that Chef Subrata shares throughout the meal that makes everything even more delectable. He also graciously shared recipes of daab chingri and Dhakai mangsho kosha that I have shared below this article. And if you’re not afraid of a bony fish, I highly recommend the steamed hilsa fish (eilish bhapey) that is rich with a beautiful mustard flavour and left me licking my fingers. A traditional meal like this is suitably rounded off with a choice of traditional desserts including patishapta (sweet crepe with a fantastic filling of coconut and reduced milk), gurer paayesh (Gobindo bhog rice slow cooked with nolen gur) and the quintessential Bengali mishi doi. Culina|44, Taj City Centre Gurugram, Sector 44, Gurugram, Haryana. Timings: Lunch 12.30pm to 3pm; Dinner 7pm to 10.30pm. 1. For the coconut milk: Scrape the flesh from the tender coconut completely and make a smooth paste using the same coconut’s water. 2. Flatten the base of the coconut by cutting off a part of it from its lower end. 3. Heat oil in a pan. Add panch phoron and allow it to crackle. 4. Add onion paste and garlic and fry. Add the shrimp and sauté. 5. In a large mixing bowl, add mustard paste, chilli paste, turmeric, salt and coconut milk. Mix well. 6. Add the sautéed shrimps to this paste and mix well. 7. Fill the coconut with the shrimps and seal the lid with wheat dough. 8. Cook for about 30 minutes at 220 degrees in a pre-heated oven. 9. Serve hot with steamed rice. 1. Marinate the mutton overnight with curd, radhuni paste, mustard oil, dry spices and 1 tbsp of the ginger garlic paste. 2. Heat the mustard oil in a heavy bottomed pan. Add the whole spices onion, tomato, ginger garlic paste and cook well. 3. Add the dry spices and the mutton and sauté well. Sprinkle hot water intermittently to avoid the mutton from sticking to the pan. 4. Add a cup of water and cover and cook for 15-20 minutes until the meat softens and water evaporates. 5. Serve hot with slit green chillies.